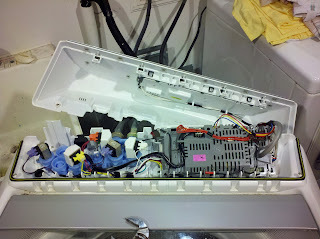 Had to stop having fun and fix a washer that stopped working. Running out of clothes. Washer stopped spinning in the middle of a load at spin cycle. 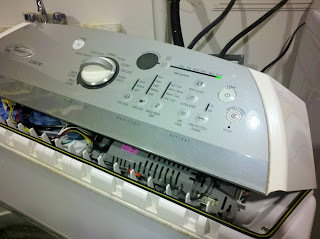 Washer is 5 years or more old, can't remember when we got it. Found June 26, 2006 printed inside. Flashes F50 code on the display, beeps, and the drum does not spin. This first started halfway through a load. After that it happens as soon as the washer enters a cycle where the drum is supposed to move. The drum moves freely by hand, so it is not mechanically bound up some how or had clothes stuck in it. Several sites say the motor control board is often the cause. But I need to check the motor first, and I'm sure this board is expensive. The guide tells you to do a motor test. You remove the control panel and ohm out some connectors. Test #3 tests the motor continuity. Fail and it's the motor, Pass and its the control board. However bad news is I can't figure out which connector is which. There are no numbers on them and no drawing. After spinning the drum by hand and pushing all the buttons for a while I got the drum to kick and move a few times. So I think the motor is OK and it is the motor control board. The board is a lot easier to replace than the motor, and from reading the internet posts the motor control board is usually the problem. So I decided that a service call would be more expensive than just buying a new board. Worst case I could resell the board on ebay and get my money back if I was wrong. This cemented my conclusion that the control board was bad. http://midwestapplianceparts.com/index.php?main_page=product_info&products_id=6418&cPath=491&utm_source=googlebase&utm_medium=cse&utm_campaign=export_feed#googlebase and they want $155.16 for it. Ebay has the board for as low as $89. I recently replaced my Maytag stove's control board and got one off ebay. It was cheap and worked perfectly. That job was so easy I didn't bother making a post on it. A year or so ago I did a post on my refrigerator, I replace the main board on it too. Funny that so many go bad, you'd think that something mechanical would be the weak link. My confidence is high that I can get a board that will do the trick. I'm going to go for a new one. I don't want to have to replace this again. Took the plunge and bought a board for $140 with free shipping. Lets hope this fixes it. I picked this one because it was new rather than used (more time before this one fails), it was the cheapest new board I could find, and it was on my side of the country. Took a week to get the board from ebay. The seller took forever to ship, should have learned not to buy from a seller that has a low feedback count. However all is well, the board came and looked new as promised. This is about a 15 minute job to fix. 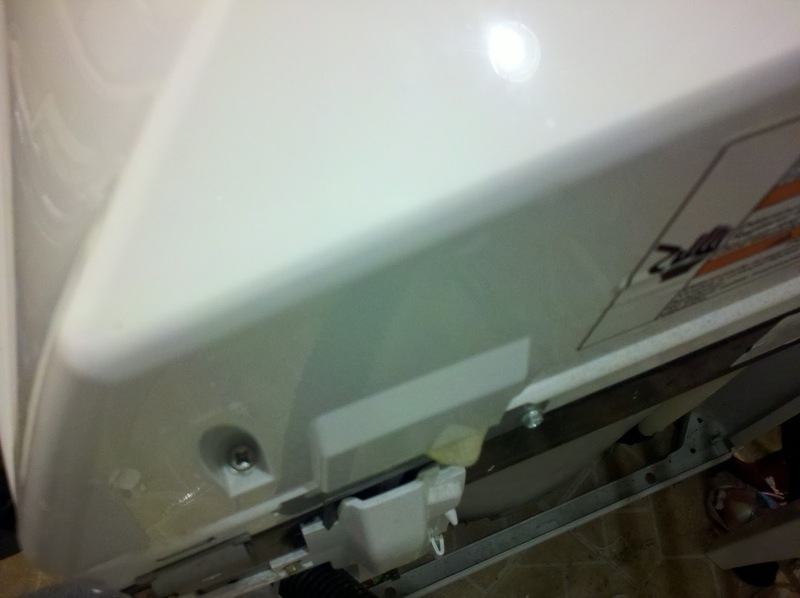 You only have to pull the washer out a few inches from the wall to access the screws. Your grandma could do it. All you have to do to replace this board is remove the three screws on the top back of the control panel and lift it off. 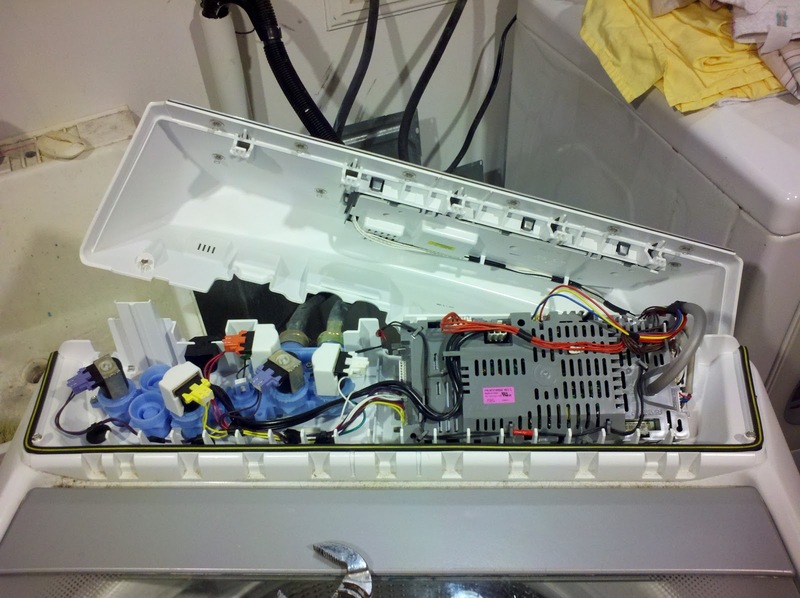 Unplug the washer first please. This is the back right of the washer showing one of the three screws (in the bottom left) you have to remove. The board is right there. It is the grey box on the right. There is one screw on the front edge that holds it down, once that is out it just swings out. I unplugged each connector one at a time and put it in the same position as on the old one. There are about 10 connectors and a small hose. The connectors come off by pushing down the plastic clip under each one. Just be careful not to mix them up. The hose just pulled off and pushed back on. Put the top back on and plugged it in. Ba da bing.... happy dance! It works!!!! No error message and the drum spins now. Washer is back on line. Now to catch up with three weeks of laundry. :-( At least I can do it knowing I saved serious $$$.